When someone asked me why I picked Chhattisgarh as a destination for my September vacation, I drew a blank. 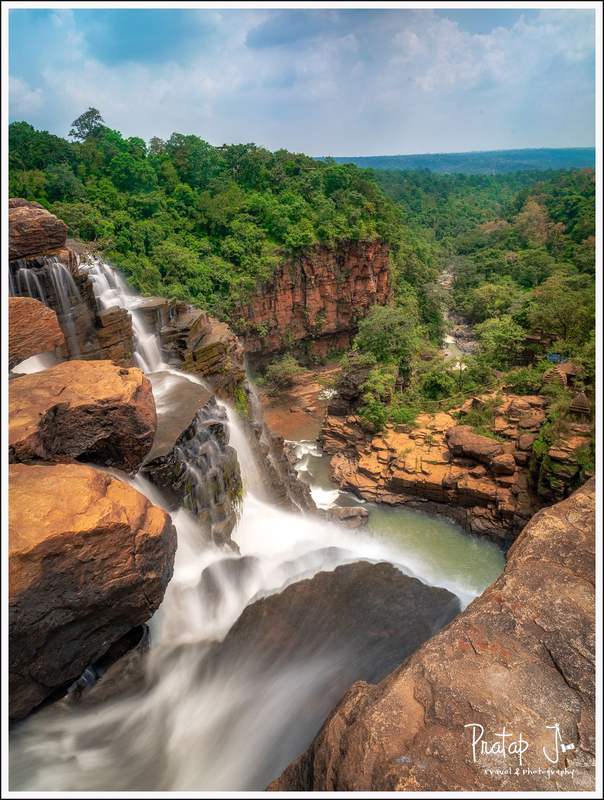 Yes, I was intrigued by the majestic Chitrakote waterfall that I saw in pictures, but was it exciting enough to embark on a thousand kilometer journey from Bangalore? With very little information in blogs about the last mile connectivity, how did I make this trip? Read on to find out. 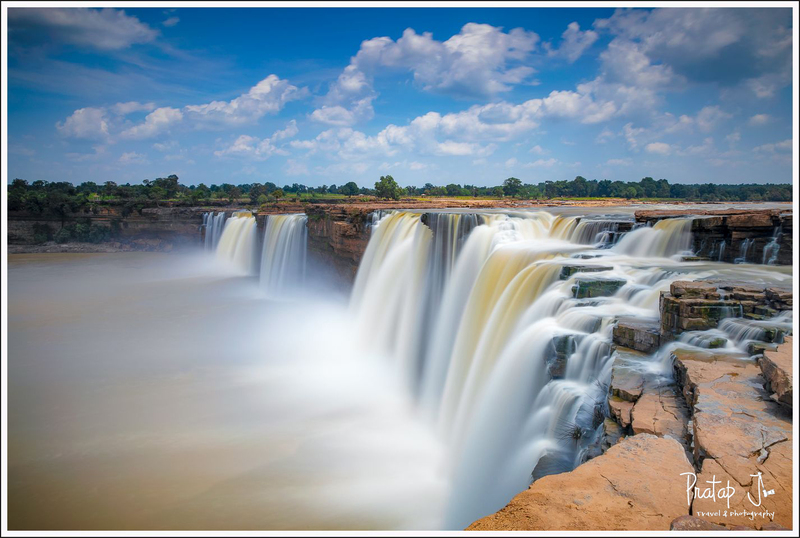 The Chhattisgarh tourism website had relevant information about the various attractions in and around Bastar, but I was left wondering how to reach Jagdalpur – the gateway city. I flew to Visakhapatnam (or Vizag) from Bangalore via a direct Indigo Airlines flight. One can also fly to Raipur, the capital city of Chhattisgarh. I picked Vizag because I had a choice of three trains that go to Jagdalpur. Also, Vizag has interesting things to see and do. One of the trains from Vizag to Jagdalpur is the VSKP KRDL PASS (train no 5850) which starts at 6.50 AM and reaches at 4.50 PM. My advice would be to take this train only if you have an extra day to stay. 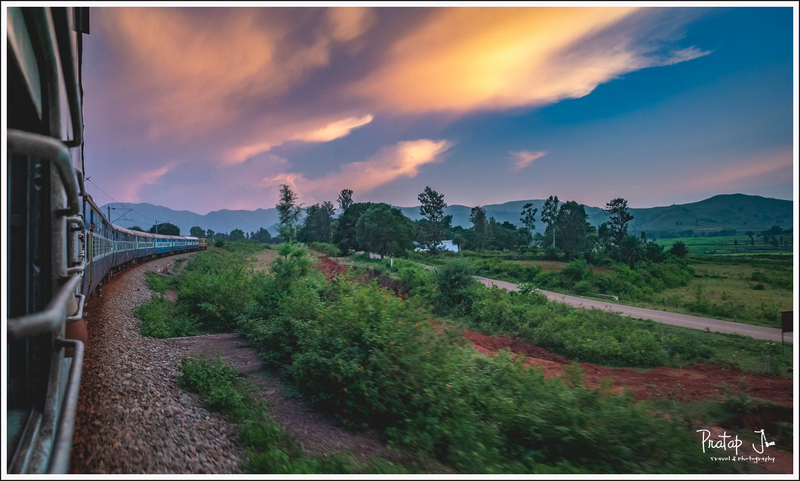 You get to see great views of the Araku Valley and the Eastern Ghats during the day journey. But this train is consistently late and takes over 10 hours to cover 322 kilometres. I took this train while returning from Jagdalpur and spent 14 hours twiddling my thumbs in a rather empty coach. Thankfully, the Eastern Ghats had some spectacular views which I enjoyed from my window seat. I could not find AC buses from Vizag to Jagdalpur. I was told that there is one private bus but I had no clue how to make an advance reservation. So you can either pick the VSKP KRDL SPL (train no. 08512) or the VSKP KRDL EXP (train no 18514) which leave Vizag after 9.30 pm and reach early next morning. Alternatively, you can take a flight to Swami Vivekananda Airport, Raipur and take an overnight bus to Jagdalpur. I did not opt for this mode of transport because I was not sure of the quality of roads (or bus) from Raipur. The DURG JDB EXP (train no 18211) between Raipur and Jagdalpur runs on Tuesday, Thursdays and Sundays only. You can also travel by a private or hired vehicle as Chitrakote is only 284 kms from Raipur. At Jagdalpur, I recommend staying in hotel Akanksha which has a 24 hour check-out policy. Chitrakote is a very small village with very limited facilities. In spite of the waterfall being so popular, public transport to Chitrakote is almost non-existent. I paid ₹3000 for a non-AC taxi from Jagdalpur to Chitrakote with pit stops to see two waterfalls. On my way back to Jagdalpur the next day, I waited forever for a government bus which never showed up. Finally, I hopped on to a shared jeep which dropped me off at a nearby village. From there I took another shared jeep which reluctantly dropped me at Jagdalpur. The driver was constantly whining that he did not have enough passengers to go all the way to Jagdalpur, so I paid him extra to drop me off at my hotel. The jeep was a tin box on four wheels and a few parts the made it move. I found only a few shops selling snacks and tribal art after reaching Chitrakote at 2 pm. There were no restaurants, ATMs or departmental stores. 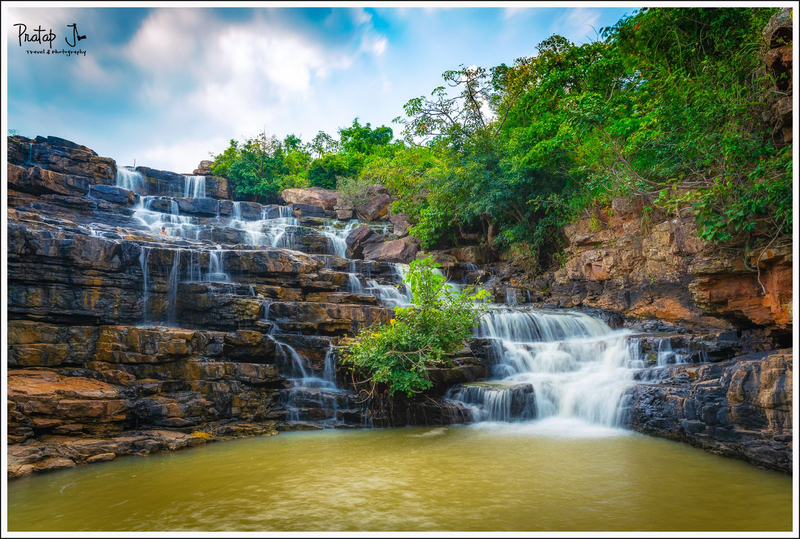 If you wish to stay at Chitrakote and leisurely explore the waterfalls of this region, Dandami Resort which is run by the tourism department is a good (and only?) option. It is a sprawling property with huge AC rooms right beside the Indravathi river and very close to the Chitrakote waterfall. You can book rooms online, but I found the occupancy rate 100% during the tourist season (monsoon and post monsoon). After reaching Chitrakote I found another property beside Dandnami. I was told that this a government run guest house which cannot be booked online, but the manager at the Dandami Resort was ready to get me accommodation there if I wanted to extend my stay. Unfortuantely for me I did not carry enough money, and not finding an ATM in Chitrakote meant that I had to stick to my original plan and stay at Dandami Resort only for one night. For a photographer, two nights at Chitrakote is not a bad idea. You can get more than once chance to shoot the waterfalls in twilight. 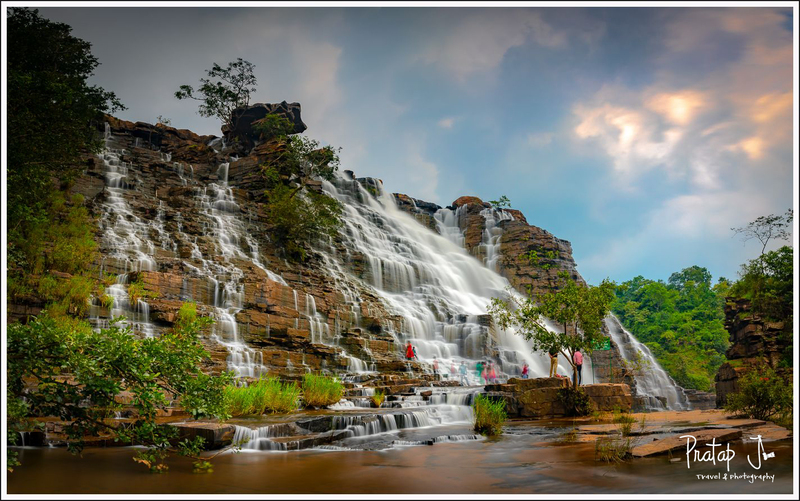 If you are agenda is to only see the waterfalls, one night is sufficient or even a day trip from Jagdalpur is good enough. Apart from visiting these places, you can also take a jeep safari inside Kanger Valley National Park to see Kutumsar Caves. The safari and caves are not operational during monsoon, so check before you plan for this. 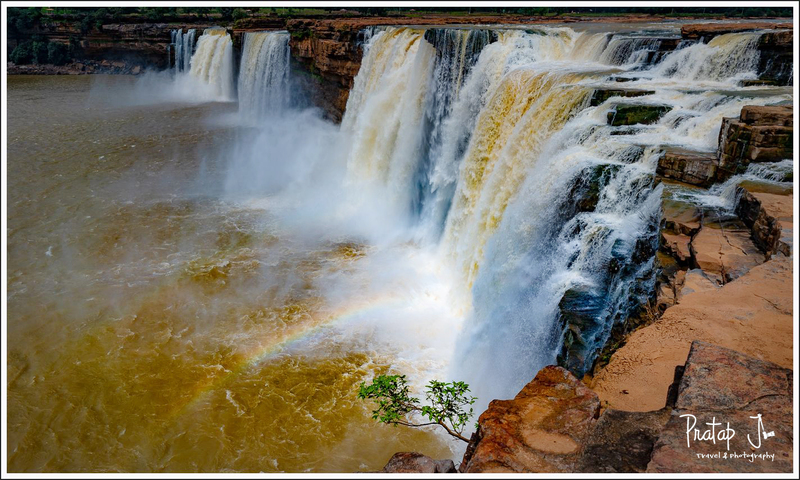 The best way to cover all four waterfalls is to hire a taxi unless you have your own private vehicle. 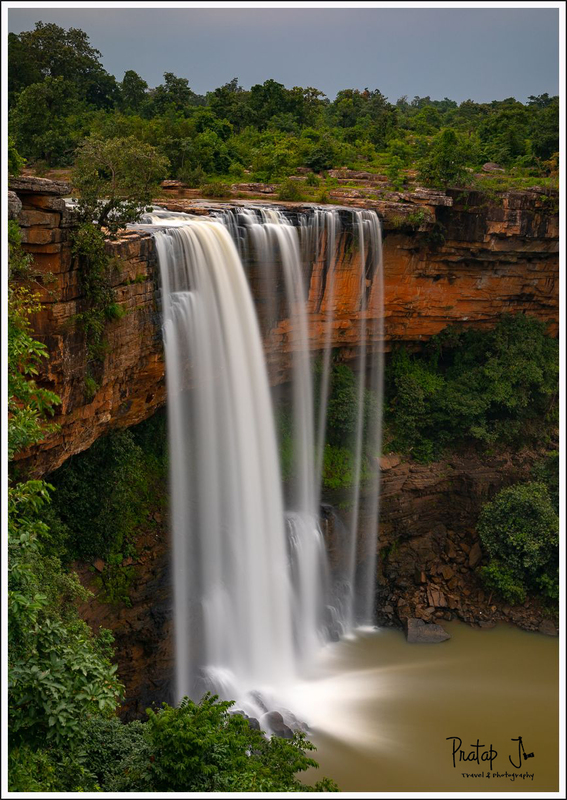 Of the 4 waterfalls, only Chitrakote is close to the highway, so having a vehicle at your disposal is recommended. If you opt for public transport, you will need to catch a bus from Anupama Cinema in Jagdalpur. If you are traveling on a budget, you can hop on and off shared jeeps that ply between villages on the Jagdalpur – Chitrakote route. Expect to catch more than one shared jeep as they only operate for shorter distances. To visit Tirathghar, you enter the Kanger Valley National park which is ticketed. I left Jagdalpur at around 10 am and reached in half an hour. The road which takes you through paddy fields is in excellent condition. Traffic is usually low, but then I did not find large contingents of tourists anywhere on my trip. Tirathghar is unique because the water cascades down several layers of rock. 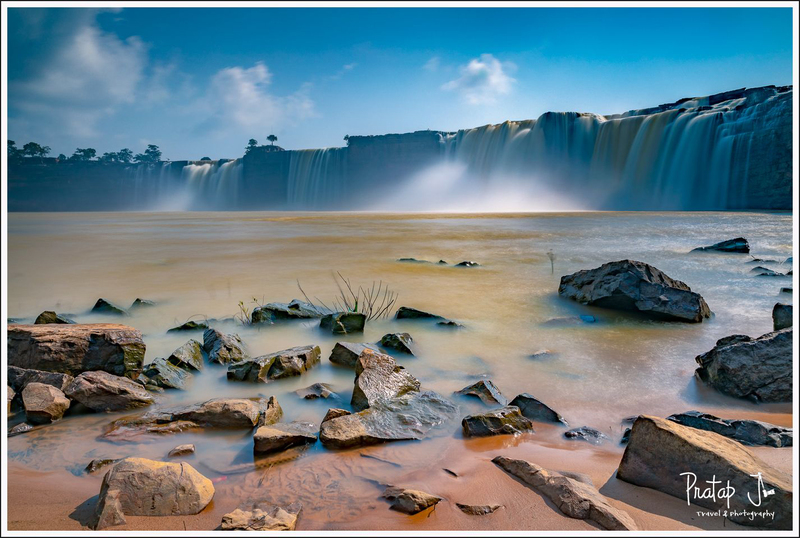 The water touches the stepped edges as it plunges down 91 metres. After paying an entry fee, and a ‘development’ fee, you enter an area which unmistakably inside a national park. You can see the waterfall both from the top, and from the base. After tumbling down gracefully over the layers of rock, the river flows into a deep valley. To reach the base, you’ll need to descend a flight of stairs which takes about 10 minutes. The path down is well constructed and offers great views of the waterfall, gorge and downstream river. Most tourists enjoy standing under the waterfall to get wet. Expect to spend at least an hour at Thirathghar and more if you wish to go deeper into the valley. 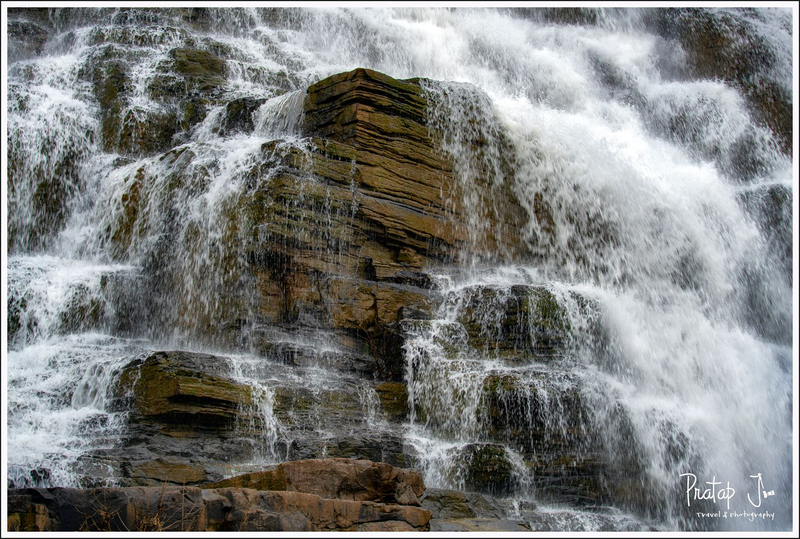 The Chitradhara waterfall is rather diminutive compared to the Thirathghar waterfall. It is enroute to Chitrakote, 3 km off the main road from Potanar, a town which is 18 km from Jadgalpur. It was mid-day when I reached the end of the road and found no signpost about the waterfall or where to go. I walked through a large paddy field to reach a small temple where I asked a few people about the waterfall. I suppose they did not speak Hindi, so I followed their hand gestures and walked down some rocks, crossed a stream, and reached the base of the waterfall. Think of Chitradhara as a smaller version of Tirathghar. You can spend around half an hour here unless you intend to take a swim. The locals of this area are tribals, so you may encounter a market (village haat) depending on when you travel. Not to be mistaken as twin sisters, Mendri Gumar and Tamda Ghumar are close to Chitrakote but off the tourist map. I rented a “Toofan” taxi which the manager at Dandnami guesthouse arranged for me. There was absolutely no information anywhere about how to visit these two places. The young taxi driver brought his buddies and little niece along. We drove past a beautiful country side which was punctuated with paddy fields and then deviated off the main road on a dirt path to reach Tamda Ghumar. This is a seasonal waterfall and the water plunges down 100m into a deep valley. That evening, there was only one another family at Tamda Ghumar. The taxi driver and his friends found my photography setup more interesting than the waterfall itself. I was quite in awe by the straight drop of the water. The red rock, green valley, and mildly overcast sky all looked deeply saturated in the warm evening light. The water was white as fresh milk. I was told that it was possible to trek down to the base of the fall and I could imagine how breathtaking the view from there would have been. From Tamda Ghumar, we drove to Mendri Gumar. This place was closer to the main road, and a thin stream of water fell down from a horse-shoe shaped piece of land. The chasm into which the water flowed was a vast and dense valley. That evening, the valley looked more majestic than the waterfall. Unfortunately it was already quite dark when we got there. Else, I would have loved to sit and watch the sky above match the open earth before me. 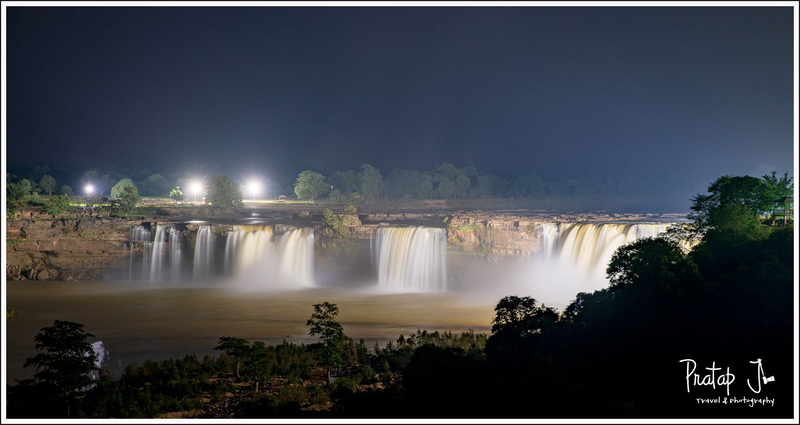 Certainly the jewel of this region, Chitrakote is a sight to behold. The Inradvati river is surprisingly calm just before it tumbles down a wide horse-shoe shaped arc. The width of this waterfall is more than the height. The weathering of the plateau above is a result of the large of volumes of water that flows down. The fierceness of the river completely dies after it hits the bottom where the water once again flows placidly. The road that leads to the Dandnami Resort runs parallel to the river and one can see the waterfall from the road. The walk from the parking lot to the waterfall is about 300m. There is no viewing gallery but a weak fence is supposed to prevent people from going close to the plunge. A well constructed flight of stairs takes you to the base of the waterfall but this path is not evident unless you are staying in one of the two properties at Chitrakote. 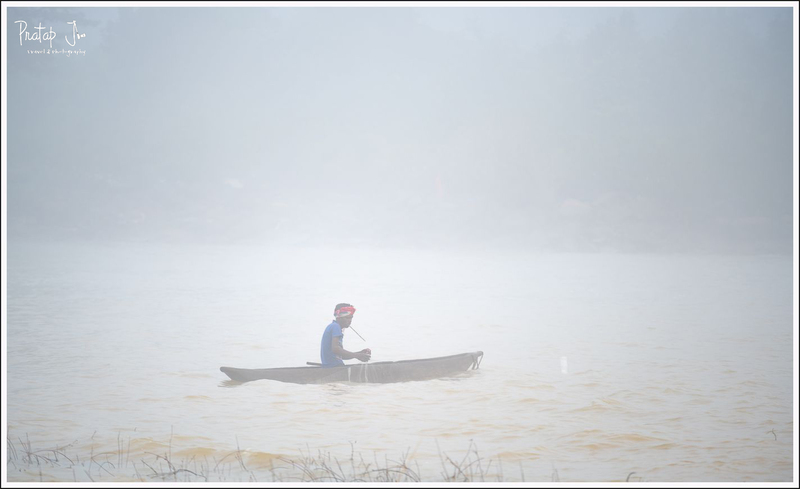 You’ll find fishermen in small boats going about their business at the base. The distance from the sandy shores to the waterfall is about 300 metres. The boatmen ferry tourists close to the waterfall in non-monsoon seasons. I walked down to the sandy beach early in the morning but was disappointed to find the entire region covered in fog. I could only hear the waterfall, but not see it. Expecting to be the only one, I was surprised when a group of photographers were already present. Like me, they were waiting for the fog to clear. When it finally cleared close to 8 pm the sun was quite high up in the sky. I could not capture the kind of photos I expected because the light was harsh. 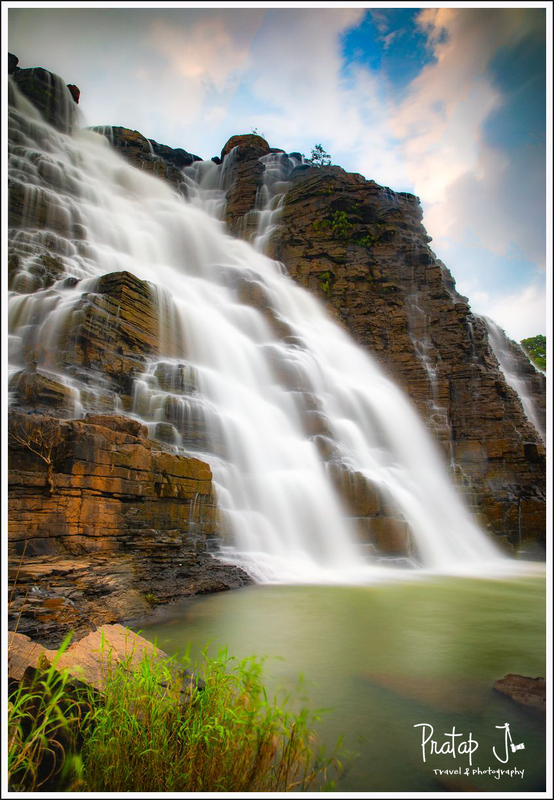 Nevertheless, spending time beside the Indravathi river, and so close to the waterfall was an experience by itself. 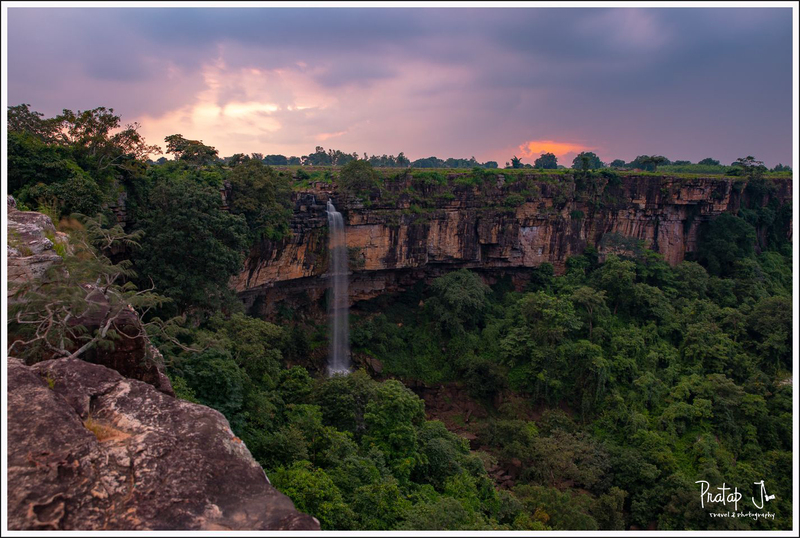 Later that day, after I checked out from the hotel, I walked up to the edge of the cliff to view the Chitrakote waterfall from top. It was a completely different experience! The raw force of gushing water was both scary and breathtaking. It was mid-day, and the blue skies and brown rock complimented each other very nicely. A feeble rainbow above a dwarf tree which was growing from the ragged edge looked poetic. Standing near the waterfall, I had a panoramic view of the jungle known as the Vindhya Range. The biggest challenge for the tourism department of any State government is ensuring that there is enough publicity for people to want to visit. In India, Bollywood is often responsible for tourist places to rocket to popularity. Chhattisgarh is a young State with just one main airport at Raipur and a history of Naxalite issues. The tourism department is quite active on social media and actively promotes the State as a nature and culture destination. Apart from the abundance of tribal culture, this region is home to caves, national parks and ancient temples like the Danteshwari Temple. And of course, Chitrakote or the Niagara of India. In spite of the delays and long travel, I found my solo trip to the Bastar region of Chhattisgarh very satisfying. I am averse to crowds – especially the ones that come from big cities and expect to find all the comforts of modern (unsustainable) living. I met a solo biker, families from smaller towns, and friendly locals. 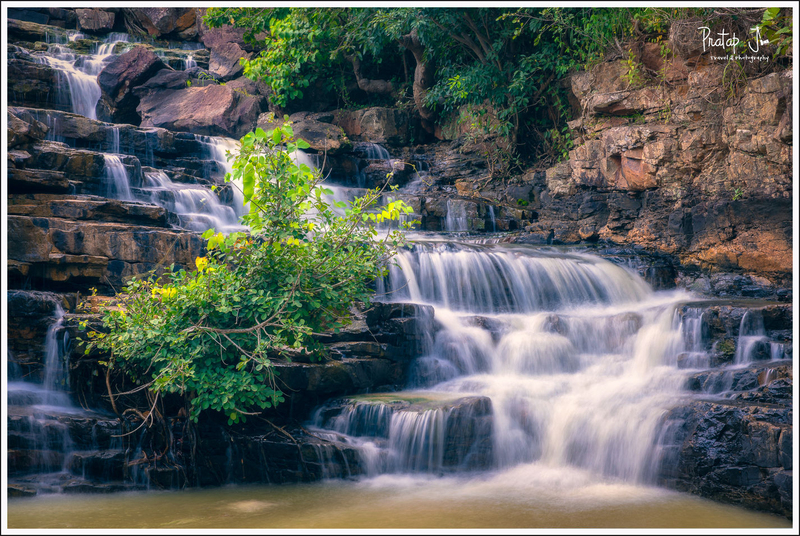 I would love to visit Bastar to cover more places and spend a little more time in each waterfall. Unfortunately, a few months after my trip this area was in the news for wrong reasons. But Chhattisgarh has now elected a new government and hopefully things will settle down for tourists to visit without the fear of naxalites.